With 36+ new students this fall, classes are filling fast! Saturday, October 12, 1:00 PM - 5:00 PM FULL! Classic, elegant or funky? 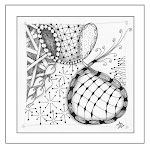 You choose the style and then learn how to use simple, yet intricate looking, Zentangle patterns to create a unique letter for yourself, or as a special gift. Tangled letters make ideal graduation, wedding, birthday and special occasion gifts. One finished work will be mounted in a precut mat and secured in a poly sleeve. Students are responsible for bringing basic materials: 01 and 08 black pens, pencils and shaders. Other materials provided include tiles, drawing surfaces and a mat with poly sleeve. Colored pens, pencils and other mediums will be available for use in class.